Beginning Sunday, all airline passengers in the United States must take off their jackets before passing through metal detectors and more will be subjected to pat-down searches and checks for explosives. Transportation Security Administration spokeswoman Yolanda Clark says screeners will advise passengers of the new procedures when they put their carry-on bags on the conveyor belt, TSA spokeswoman Yolanda Clark said. The goal is "to fortify our screening procedures to detect the presence of explosives carried on a person or in carry-on luggage," she said. 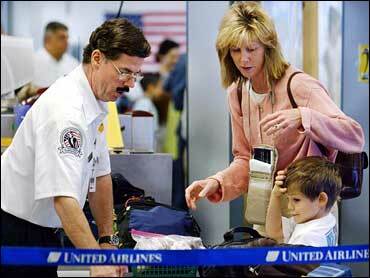 Bags checked onto planes must pass through machines that can detect various kinds of explosives. But neither the walk-through metal detectors that passengers use on the way to gates nor the X-ray machines for carry-on bags can sense plastic explosives. So now, every passenger selected for secondary screening after passing through metal detectors will have their carryon items subjected to checks by explosives trace detectors. Screeners also have more discretion to conduct pat-down searches and check carryon bags for bombs. Air Travelers Association President David Stempler said the changes are a good idea, though some passengers could be upset by hand searches. "Given the extraordinary need for it - given the recent bombing of the planes in Russia, heightened security alerts, tension leading up to the election - I think these are necessary evils that passengers have to put up with," he said. Two Chechen women are suspected of carrying bombs onto two Russian planes that exploded almost simultaneously last month. The Sept. 11 commission recommended in its final report that the TSA make it a high priority to improve the ability to detect explosives on passengers at security checkpoints. "As a start, each individual selected for special screening should be screened for explosives," the report said. The TSA also is testing walk-through bomb-detection machines at five airports. Document scanners that can pick up explosives residue on boarding passes and IDs are being tested at Washington Reagan National Airport.